There's something so refreshing about a pasta that isn't bogged down with a heavy tomato sauce. Don't get me wrong, I'm a fan of a the traditional spaghetti - especially if it's with my mom's sauce - but it's nice to have options when you're in the mood for something a little bit lighter. This pasta is just that. It has linguini noodles but also strings of zucchini that act like 'pasta' which compliment the ricotta and lemon perfectly. 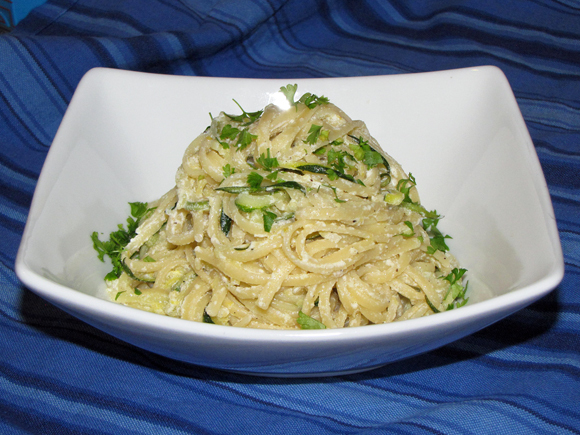 If you have a mandoline, you can julienne the zucchini easily and quickly. If you don't, just cut the zucchini into long strips about the width of matchsticks. It will still be easy, but it will take a little longer. 1. Sprinkle zucchini with enough salt to cover it all (about 1 - 2 tsp) and then put in colander to drain. 3. Once the water boils, add pasta and cook according to directions. 4. When you put the pasta in, rinse and drain the zucchini. Pat dry with a paper towel and set aside. 5. Add garlic to a large saute pan with 2 TB oil and cook for a minute over medium heat. 6. Add zucchini and cook for a few minutes (until tender but still crisp) while waiting for pasta to be done. 7. When the pasta is done, add it directly from boiling pot to the saute pan with zucchini and stir. 8. In separate bowl, mix ricotta, lemon juice and zest. 9. Pour sauce over noodle/zucchini mix and stir well. If it's a little dry, add some of the 1/4 c pasta water - a little at a time. 11. Sprinkle with parmesan cheese before serving if desired.